Elephanta Caves is one of two UNESCO World Heritage Sites in Mumbai. Elephanta Caves consists of 7 rock-cut Hindu Caves and 2 Buddhist Caves. There are beautiful carvings in stone in some of these caves. Enjoyable ferry boat ride to reach Elephanta Caves. Elephanta Island has nice treks and walks. Elephanta Caves are one of Mumbai’s Top 10 Tourist Attractions. 2 HILLS OF ELEPHANTA ISLAND: “Elephanta Island”is a small island 11 Km (7 Miles) to the East from “Gateway Of India”. It is made up of two hills/hillocks. The Southern Hill has the Jetty and most of the tourist attractions. It is called “Cannon Hill” or “Gun Hill”, and the Northern Hill is called “Stupa Hill”. ELEPHANTA CAVES: World Famous UNESCO World Heritage Site of “Elephanta Caves” is located on the Southern Hill of Elephanta Island. Elephanta Cave complex consists of 7 Caves with carvings of Hindu deities. On the Northern Hill, there are 2 Buddhist Caves which have not been fully excavated and are not open to the public. ELEPHANTA FERRY JETTY: Boats from Gateway Of India come and depart from the Elephanta Boat Jetty. From the Elphanta Jetty it is a short walk to the base of the hill and from there it is a 1 Km upward climb to the caves. 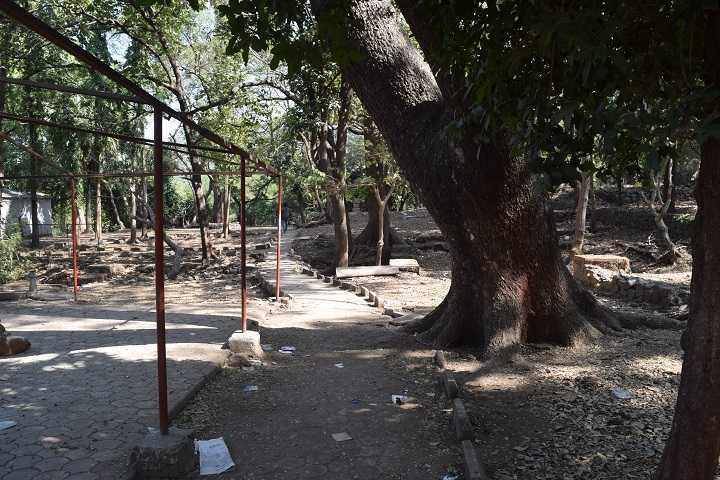 PATH TO REACH ELEPHANTA CAVE COMPLEX: There are two ways of reaching Elephanta Caves. First is a Staircase going uphill to Elephanta Caves. There are many souvenir stalls along the staircase. The second route is a rough, but easy trekking path that goes parallel to the staircase. To get onto this trekking path start on the stairway and after a short distance there is a garden gate to the left. 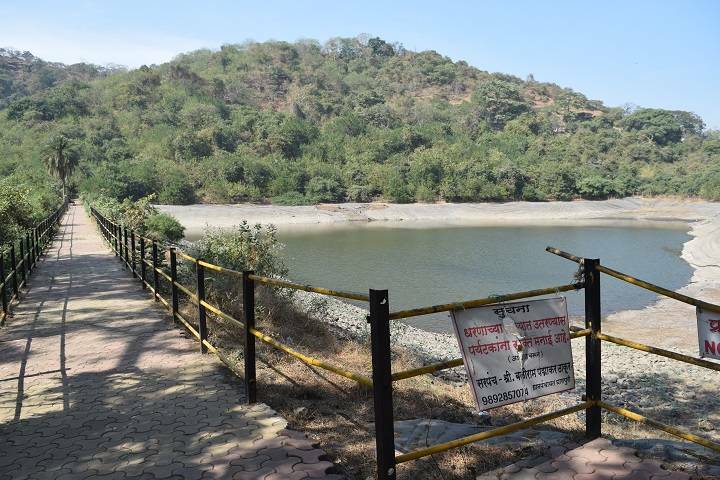 (Below picture shows the start of the trekking path to Elephanta Caves). Take this path because it is more fun and less crowded. This path ends on a concrete road. Take the right path to reach the entrance of the Elephanta Cave Complex. The road to the left goes to Elephanta Island Lake and Rajbandargaon Village. NOTE: Visitors who are unable to climb stairs can hire porters to take them to the Elephanta Temple complex. Porters use a “Palki” (palanquin), which consists of a chair and two bamboo rods. Porters charge Rs 2,000. THREE VILLAGES OF ELEPHANTA ISLAND: “Shetbandar” (village which has the jetty, stalls, staircase and the caves), “Rajbandargaon” (Village on the South-East side of the island, which faces Jawaharlal Nehru Port Trust (JNPT)) and “Morabandargaon” (village on the North Side surrounded by forests). 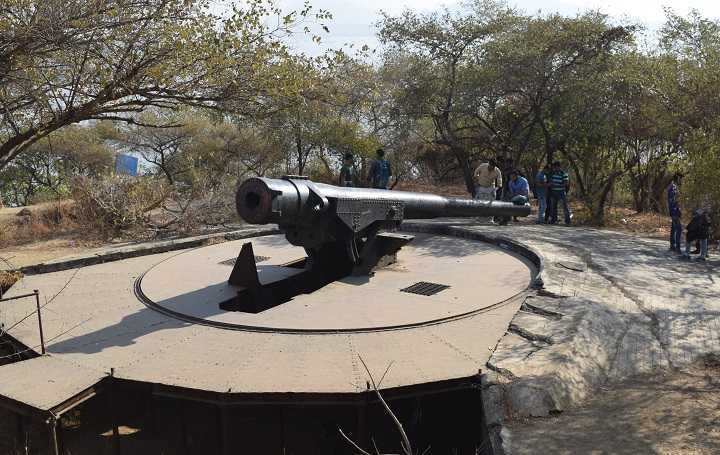 COMPLETE TREK AROUND ELEPHANTA ISLAND: There is a pathway that connects the Elephanta Jetty to Elephanta Caves, to the man-made lake, to Rajbandargaon Village (in the South-East), from there to Morabandargaon Village (in the North) and finally reconnects to the jetty. 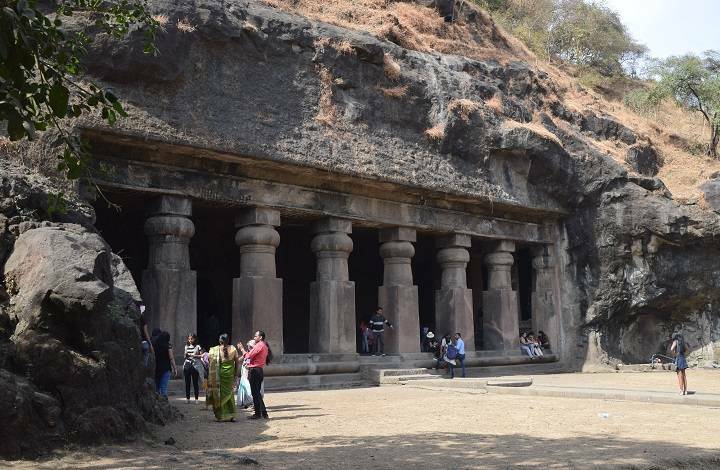 For those interested in taking a walk around Elephanta Island, we suggest they should see Elphanta Caves, Cannon Hill and then come down to the man-made lake and take a round around Elephanta Island. This is an easy trek which ends at the jetty from where visitors can catch a boat back to Gateway Of India. CANNON HILL: Close to the entrance of the Elephanta Caves Complex is the MTDC Restaurant. There is a pathway to the right of the MTDC Restaurant that leads to the top of the Southern Hill called “Cannon Hill”. There are two large cannons on this path. From the top there are nice views of Elephanta Island, JNPT Port, Mumbai Port, Navi Mumbai, nearby Islands, Elephanta Lake and the Arabian Sea. ELEPHANTA LAKE AND LAKE GARDEN: On the route to Rajbandargaon Village is a man-made lake which stores rainwater. This water is for the residents of Elephanta. This is the “Aadiyogi Shiv Elephanta Lake”. There is a path along the lake that leads to stairs. These stairs go up to Cave 6 and the Southern Hill. Unfortunately this stairway is closed to the public. There is a minor garden near the Lake. The official name of Elephanta Island is “Gharapuri” (Island of Caves). Portuguese named the island Elephanta after seeing a statue of an elephant. This elephant statue is now placed outside Mumbai Zoo and Dr. Bhau Daji Lad Museum. In 1987 Elephanta Caves were designated an UNESCO World Heritage Site. UNESCO conferred this honour on Elephanta Caves based on the following two Cultural criteria – “Masterpiece of human creative genius” and “Exceptional Testimony to a Cultural Tradition”. Carved into the hills of Elephanta Island is a rock-cut Hindu Temple complex, consisting of seven caves (Caves 1 to 7). The main deity of these basalt rock Hindu cave temples is Lord Shiva. These caves date back between 5th and 7th century AD. Elephanta Island also has two Buddhist Caves, which have a Buddhist Stupa. Unfortunately these Buddhist caves have not been fully explored and are not open to the public. Collectively these temple caves are called Elephanta Caves. The main deity of the Elephanta Hindu Temple caves is Lord Shiva. Cave 1 is the most impressive of all the Elephanta Caves. 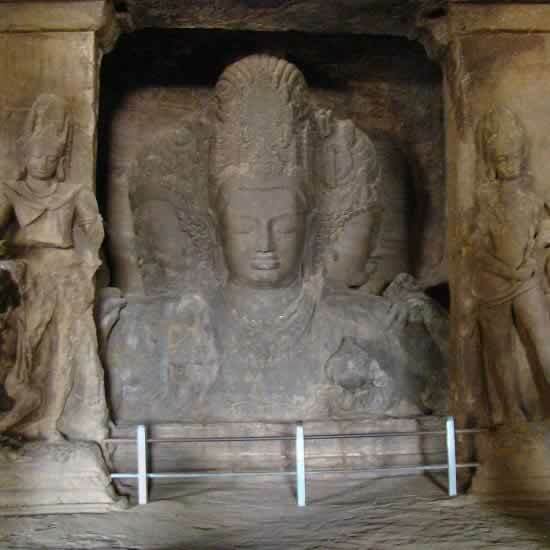 The centrepiece of the main Elephanta Cave is a large 7 meter (20 feet) three face idol of Lord Shiva. The fierce masculine Shiva face (“Bhairava” or “Aghora”) on the right of the Shiva idol represents Destruction. The Shiva face in the middle represents Harmony and Preservation (“Mahadev” or “Taptpurusha”) and the feminine face of the left represents Creation (“Vamadev” or “Uma”). This statue is called the “TriMurti” – “Tri” means three and “Murti” is idol. The Trimurti statue is also called “Mahesh” Murti (“Maheshmurti”) and “Trimurti SadaShiva”. Elephanta Cave 1 is 39 meters from the front to the back of the cave. Although many of the idols have suffered because of the passage of time and at the hands of vandals, it is still possible to appreciate the amazing craft and creativity of the sculptors who created these masterpieces. Besides the Trimurti (Maheshmurti), some of the other prominent Lord Shiva statues at the main Elephanta Cave 1 include Lord Shiva with his wife Parvati at their abode on Mount Kailash, half Shiva half Parvati idol (“Ardhanarishvara”), wedding of Lord Shiv and Parvati (“Kalyanasundara”), an angry aggressive Shiva slaying Andhaka (“Bhairava”, “Andhakasura Vadha”), dancing eight hand Shiva (“Nataraja”), meditating Shiva (“Yogeshwara”, Lord of Yoga), Shiva with Ganga in his hair (“Gangadhara”) and Ravan trying to lift Mount Kailash (“Ravananugraha”). To the right of the main pillared Cave 1 there is a large Shiv Ling in a room with four entrances. In the side sections of Cave 1, there is a statue of eight Mother Goddesses (“Ashtamatrikas”). Lord Shiva’s sons, Ganesha and Kartikeya flank the Goddesses. There is also a large statue of Lord Ganesha, the Hindu Elephant God and the son of Lord Shiva. After the main first cave, the third cave is the most impressive. It has large columns at its entrance and lovely carvings on its ceiling. The fourth cave has a big Shiva Linga. The second and fifth Elephanta Caves are unfinished. It is thought that the Hindu Elephanta Caves were carved from the middle of the 5th century to the 8th century. Elephanta Caves 6 and 7 are two Buddhist caves. Cave 7 is believed to have been carved in 2nd century BC. There are Buddhist Stupas in this part of Elephanta. When the Portuguese ruled over Elephanta Island and Bombay, they converted Cave 6 into a Church. Elephanta has a small museum, a restaurant run by Maharashtra Tourism and many small souvenir shops. This is a link to a website that has more Information on Elephanta Caves. Elephanta Caves is located on Elephanta Island, also known as Gharapuri Island, which is 11 Km (7 Miles) East of Mumbai’s Gateway of India. 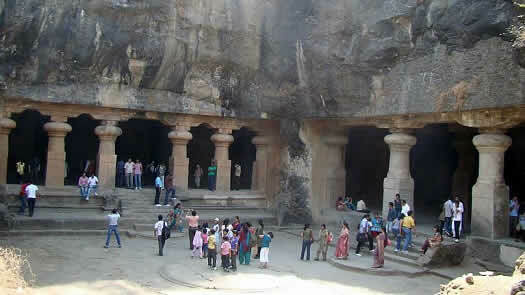 Coordinates of Elephanta Caves is N18 58 0.012 E72 56 8.988. Getting to Elephanta Island and Elephanta Caves is part of the enjoyment of visiting this UNESCO World Heritage Site. To get to Elephanta Caves, take a boat ferry from Gateway Of India. Ticket for the Elephanta Ferry can be booked at the booking office, which is at the entrance of the Gateway Of India complex. Adult boat ticket cost Rs 200 and Children’s (ages 3 to 7) ticket cost Rs 125. 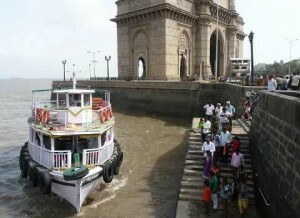 Ferries from Gateway of India to Elephanta start at 9:00 am. The last boat from Gateway Of India to Elephanta Island leaves at 3:30 pm. The first boat from Elephanta to Gateway Of India leaves at 12 noon; and the last return boat from Elephanta to Gateway is at 5:30 pm. Elephanta ferries usually leave at a frequency of 30 minutes. One way trip takes around an hour. On an average Elephanta ferries can transport 100 passengers. Uber has a boat service from Gateway Of India to Elephanta Caves and back. Uber boats can transport 6 to 10 passengers per trip. Prices for Uber charter from Gateway Of India to Elephanta start at Rs 5,400 for a one way trip. Please refer to Uber India app/website for more information. Elephanta Boats leave from the pier on the left after the main security check at Gateway of India. NOTE: There is NO ELEPHANTA CAVES FERRY SERVICE during the Monsoon season, which is from the first week of June to mid/end September. Elephanta Caves are CLOSED TO VISITORS ON MONDAY. Government approved tourist guides are available at the entrance of the Elephanta Caves Complex. Government Tourist Helpline number is 1800111363. Elephanta Island Tourism Mobile Number is 8422822109. 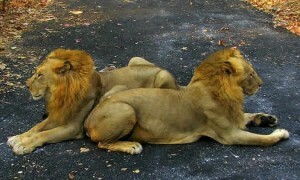 Maharashtra Tourism Number is (022) 22024482/22845678. The luxury ferry boat to Elephanta cost Rs 200 for Adults and Rs 125 for Children between the ages of 3 to 7. Children below 3 years travel for free. Uber has boats that start at Rs 5,400 for a one-way trip. There is an additional charge of Rs 10 to travel on the upper deck of the ferries to Elephanta Island. This is paid on the boat itself. Entry ticket to Elephanta Caves is Rs 10 for Indians. Foreign tourist from SAARC countries, Thailand and Myanmar also pay only Rs 10 as entrance fee to Elephanta Caves. 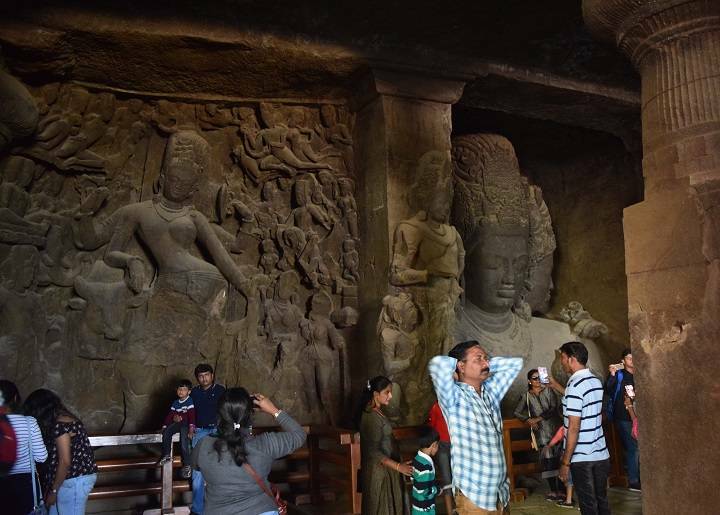 All other foreigners pay Rs 250 for entry ticket to Elephanta Caves. There is a nominal charge for camera. 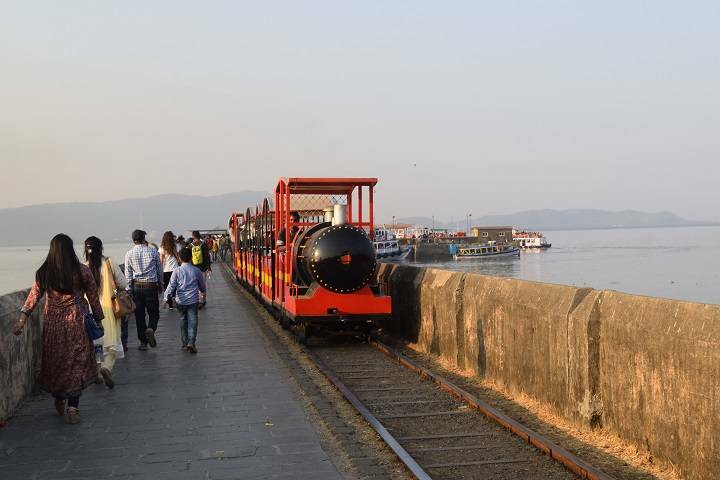 One way ride on the Elephanta toy train cost Rs 10. NOTE: span class=”highlight”>Elephanta Caves are CLOSED ON MONDAY. First Boat Ferry from Gateway of India to Elephanta Island leaves at 9:00 am and the last boat from Gateway Of India leaves at 3:30 pm. The first return boat from Elephanta Caves to Gateway Of India leaves at 12:00 noon and the last return boat leaves Elephanta Island at 5:30 pm. There is no Ferry service to Elephanta Caves on Monday and during Mumbai’s Monsoon season. So Elephanta Caves are shut from the first week of June to the mid/end of September. The boat ferry to Elepahanta Island can cause sea sickness. Avoid having fluids at least 30 minutes before the boat ride. Visitors may also want to take medication that prevents sea sickness and nausea. Please consult your doctor before taking medicines. A return trip to Elephanta Caves can take over four hours. Do carry water and snacks or a picnic lunch. There is plenty of food and water available on the island. Carry food to feed sea gulls that hover around the Elephanta boat. Mumbai can be hot and humid for most part of the year. It is advisable to wear clothes made of breathable natural fabric, such as cotton. Wear comfortable walking shoes since there is a fair amount of walking to reach the Caves Temple complex. Do take a pair of sunglasses, a hand towel and a hat. Apply sunscreen. Expect to perspire a lot. Do carry water and stay hydrated. The first boat to Elephanta Caves is less crowded than the later boats. On the return the boats returning at 5:30 pm can be crowded. 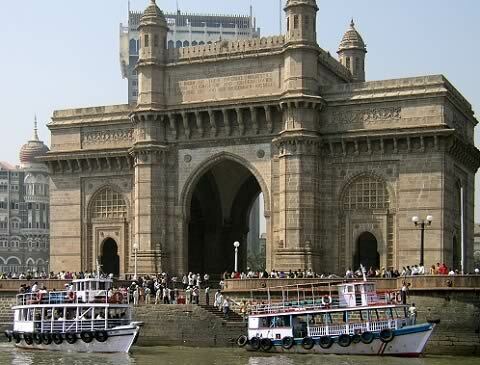 The one way boat journey from Gateway Of India to Elephanta Island takes around one hour. The area around Gateway Of India and South Mumbai is a major tourist hub. There are many restaurants, pubs, galleries, historic buildings, shops and places of interest near Gateway of India. The Museum, NGMA, Jahangir Art Gallery, Mumbai University, Bombay High Court are some of the places of interest. This is an article on a One Day Walking Tour of Mumbai’s Main Tourist Places. Most of these tourist attractions are in South Mumbai and within walking distance of Gateway of India. Please see the Picture attachments for picture credits and license.